It’s a well-worn fact that good habits help keep us safe. Nothing comes for free, however, and the same habit that serves us well most of the time can be a deadly trap in the wrong circumstances. Consider the descent to minimum descent altitude (MDA) after crossing the final approach fix (FAF). Back in the pre-GPS days when many of us flew without even distance measuring equipment (DME), the mantra when crossing the FAF was the “Five Ts”: start the Timer (to identify the missed approach point), Turn to the final approach heading, Throttle as needed for the descent, Tune (or Twist) the CDI to the final approach course, and Talk to ATC and CTAF (or Tower) as appropriate. Much of this is automated or obvious with a GPS approach, but it’s still generally the procedure to cross the FAF and descend to MDA—except when it isn’t. This brings us to the RNAV (GPS) Rwy 36 approach into my home ‘drome of Portland, Maine. Like all FAFs, ZIRSO is marked with the maltese cross. We must cross ZIRSO at or above 1800 feet and the MDA for straight-in to Runway 36 is either 460 or 560 feet, depending on your avionics (more on that in a moment). The tricky bit here is a mandatory altitude inside the FAF that catches pilots off guard. You must cross BEYDA at or above 700 feet. This unusual “extra” stepdown exists because there’s a tower almost centered on the final approach course. You can see in the color profile view of the image above that BEYDA is located at that tower. Once past it, you can descend the extra 240 feet if you have WAAS GPS. If you’re wondering how there can be a second tower in the color profile view that looks like it’s the same altitude closer to the runway, remember this profile view is set to consider obstacles four miles either side of course. Those towers closer in are to the left or right of the final approach course, and would disappear from the profile view if we selected a narrower corridor to check for obstacles. It’s also an indication of why the WAAS and non-WAAS MDA differ by 100 feet. There’s no option on this approach for vertical guidance. Even avionics that offer LNAV+V “advisory” guidance won’t do it here. If you have WAAS, you can fly to the Localizer Precision (LP) minimums, because your GPS guarantees tighter course guidance and keeps you clear of those towers inside BEYDA. Non-WAAS GPS allows a bit more error, the MDA must be 100 feet higher to keep those towers out of the protected airspace left and right of the approach course. There’s an additional “habit hazard” for users of older, non-WAAS GPS, such as the KLN 90 or Apollo GX series. These GPS systems don’t have a method in their data structures for fixes inside the FAF— so those fixes do not appear in the flight plans when flying the approach. The approach appears to sequence directly from ZIRSO to RW36. 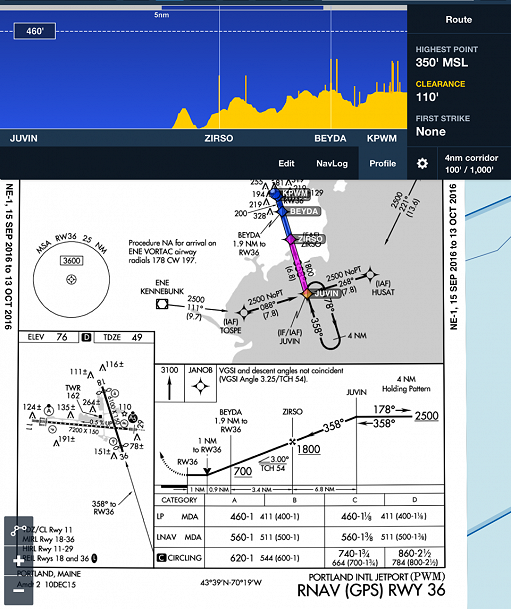 You can still fly the approach as published on older navigators because the profile view actually spells out “BEYDA 1.9 NM to RW36.” This means you can use your certified GPS to identify BEYDA as long as you have a distance readout to RW36. You don’t need to see BEYDA in the database. Note that other fixes such as ZIRSO and JUVIN don’t have this extra verbiage. If you’re flying older equipment, let that verbiage in the profile view be a clue for this extra step-down. Even with new equipment, watching for those inside step-downs is a good procedure. It’s never too late to improve a habit. While we’re talking about distances to RW36, note the “V” at one mile from the Runway 36 threshold. This is the visual descent point (VDP), and indicates the point where a normal glidepath descent can be made to the runway. How can you zoom in on a specific section of the profile view to see the obstruction in greater detail?